Author(s): Chenglong Li, Li Deng, Qiaoming Zhi, Qingyou Meng, Aimin Qian, Hongfei Sang, Xiaoqiang Li, Jiazeng Xia. Department of General Surgery and Translational Medicine Center, Nanjing Medical University Affiliated Wuxi Second Hospital, Wuxi, 214002, China. 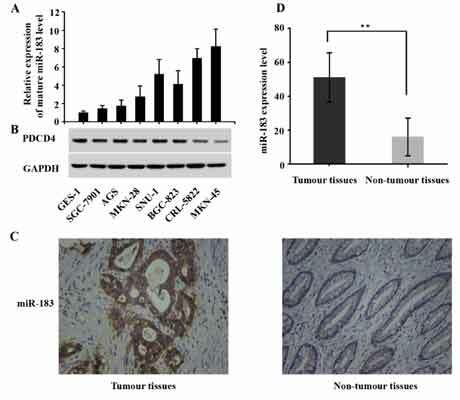 MicroRNA-183 (miR-183) has recently been identified to be implicated in a variety of critical processes in multiple human malignancies, and its fuction has been poorly characterized in gastric cancer (GC). Here we reported that miR-183 was markedly over-expressed in GC and its up-regulation was markedly associated with GC clinicopathologicalcharacters. Endogenous miR-183 was inhibited in GC cells, which dramatically attenuated cell proliferation, colony formation, migration, invasion and adhesion and enhancedGC cells apoptosis in vitro. Furthermore, in this study we demonstrated that the tumor suppressor gene PDCD4 was a target of miR-183 in GC. Collectively, these observations showed that miR-183 maybe function as an oncogene by regulating GC cell proliferation, apoptosis and metastasis and the oncogenic effect of miR-183 may relate the direct targeting PDCD4. Keywords: Apoptosis, gastric cancer, metastasis, MicroRNA-183, PDCD4, proliferation. Affiliation:Department of General Surgery and Translational Medicine Center, Nanjing Medical University Affiliated Wuxi Second Hospital, Wuxi, 214002, China. Keywords:Apoptosis, gastric cancer, metastasis, MicroRNA-183, PDCD4, proliferation. Abstract:MicroRNA-183 (miR-183) has recently been identified to be implicated in a variety of critical processes in multiple human malignancies, and its fuction has been poorly characterized in gastric cancer (GC). Here we reported that miR-183 was markedly over-expressed in GC and its up-regulation was markedly associated with GC clinicopathologicalcharacters. Endogenous miR-183 was inhibited in GC cells, which dramatically attenuated cell proliferation, colony formation, migration, invasion and adhesion and enhancedGC cells apoptosis in vitro. Furthermore, in this study we demonstrated that the tumor suppressor gene PDCD4 was a target of miR-183 in GC. Collectively, these observations showed that miR-183 maybe function as an oncogene by regulating GC cell proliferation, apoptosis and metastasis and the oncogenic effect of miR-183 may relate the direct targeting PDCD4.